Spotted in the Fiji Sun yesterday: Fiji National University is running a conference on finance and investment with the theme of “Reconciling Governance Systems and Deepening the Financial Sector in Market Economies”. According to the draft programme on the FNU web site, on Day 1 the conference will be opened by Fiji’s Prime Minister Voreqe Bainimarama – to be confirmed – and Day 2 will be opened by Fiji’s number 2 in command, Attorney General Aiyaz Saiyad Khaiyum whose multi-ministry mandate includes the post of Minister for Trade and Commerce. A packed Day 1 begins with a plenary session on the mining sector in Australia and China with lessons for Fiji, followed by a session on global auditing standards, three paper sessions running in parallel, on 1) investment and financial development, 2) audit and accounting, as well as 3) culture, gender and health; and two plenary sessions follow on investment in Fiji, and investment trends in a global economy. The day finishes with two paper sessions running in parallel on miscellaneous issues and a notable session on the role of financial institutions in growth attended by the chief executives of the five major banks operating in Fiji including of ANZ, BSP and Westpac. An almost equally packed Day 2 begins with plenary sessions on competition policy and the implications of demographic change for growth in the Pacific region; followed by three paper sessions running in parallel, two of which are on unfair trading practice and mediation, and one focuses on price regulations in Fiji. After lunch two plenary sessions follow on growth opportunities from economic integration between PICs from USP former head of economics Biman Prasad, and monetary policy transmission. Following these sessions are two parallel paper sessions themed mainly on regulation of pricing and on trading fairness issues. Day 3 contains four plenary sessions on the vulnerability and resilience of small states given by the rather eminent Professor Lino Briguglio who was, among many other things, a lead author for the Intergovernmental Panel on Climate Change Third and Fourth Assessment reports, the potential of ICT, mobile money and on ICT security. The conference finishes with a panel session on ICT security and a tour of the FNU campus. At the Fifth Heads of Agriculture and Forestry Services meeting on 24-27 September 2012 two keynote speeches laid out the overall challenges for agriculture in the Pacific region. The first is a speech by SPC Director-General Dr Jimmie Rogers, closely based on the LRD Issue Paper entitled “Managing Strategic Risks to Agriculture and Forestry in the Pacific”, which is available here. The following two posts will contain the content of the speeches. This first post is intended as a shorter, digestible version of the LRD Issue Paper on which Dr Rogers’ speech was based. 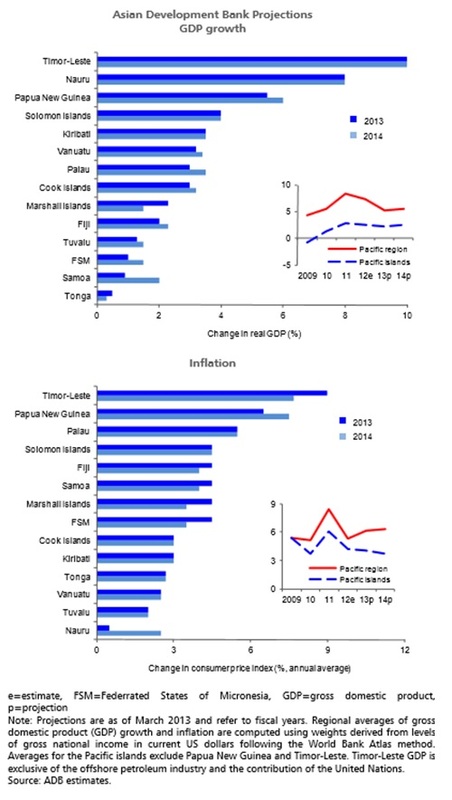 Low growth in the agriculture sector from the period 2004-2010 – with the exceptions of Solomon Islands and Palau. Low levels of public expenditure on the agriculture sector, relative to both participation rates in agriculture and its contribution to GDP. Household Income and Expenditure Surveys, that count value of home produced food consumed as household income, indicate that agriculture for subsistence provides a significant proportion of poor rural households’ income. High labour force participation rates in the sector and HIES figures on the significance of the sector for household income underline the importance of agriculture from a sustainable livelihoods perspective; whereas low growth and low public expenditure in agriculture indicate that the sector is not delivering sufficient benefits to its participants and that government resources to tackle agricultural issues are scarce. The importance of the sector combined with the scarcity of resources to tackle the challenges, underlines the need for a strategic, optimum impact approach to tackling the key challenges in the sector. The narrow genetic base of most Pacific Island crops that increases the risk of these crops succumbing to disease and natural disasters; the consequent need to monitor pests and diseases and ensure the research and breeding programmes are in place to manage any outbreaks. The need to assist farmers with methods of sustaining production during or otherwise coping with extreme weather events; and balancing the need for resilient varieties of crops with the need to enable farmers to produce varieties that sell well in sophisticated markets such as hotels and supermarkets. The need to produce and disseminate crops that are better adapted to cope with the challenges associated with climate change such as drought, floods, higher rates of salinity and pests and diseases. 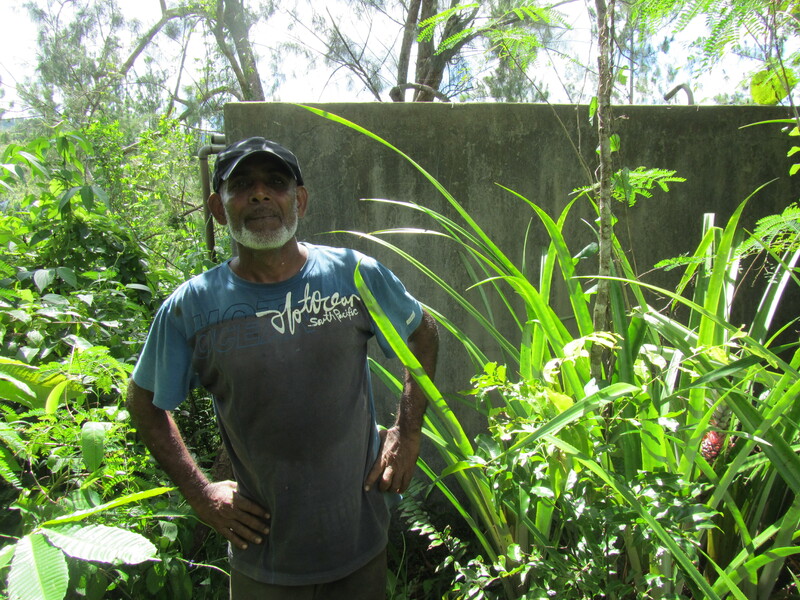 The LRD Issue Paper underlines the work of the LRD Genetic Resources team with its Centre for Pacific Crops and Trees, which conserves and makes available for utilization thousands of varieties of Pacific crops. 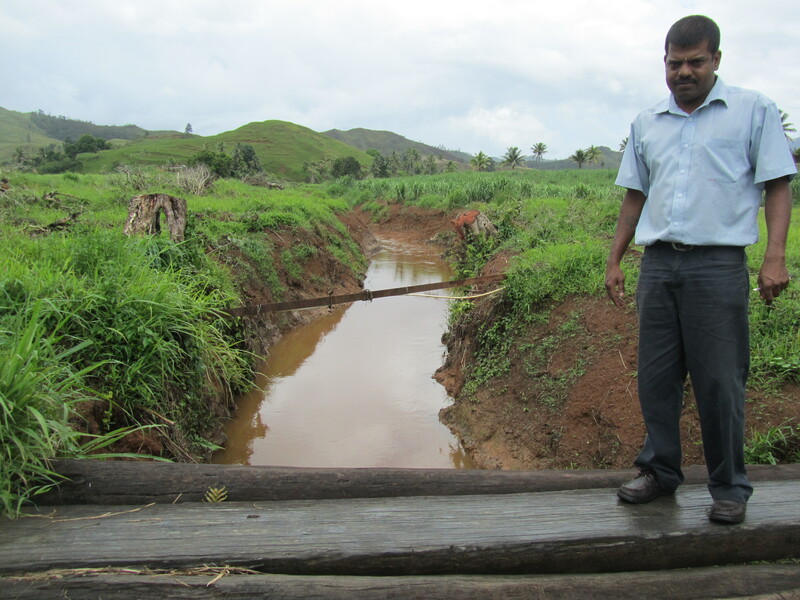 In the Pacific, about 70% of agriculture is rain fed. Subsequently, predictions of prolonged variations in normal rainfall patterns wrought by climate change could be potentially devastating for agriculture in the region. Rising temperatures will change the distribution of pests, invasive species and diseases in the region. The increasing frequency and severity risk of natural disasters such as cyclones, as well as new pest and disease incursions directly threaten agricultural productivity. The particular vulnerability of commercial farming – compared to traditionally resilient subsistence farming – to natural disasters. The move to intensive cultivation over the last generation, but the failure of sustainable land management practices such as such as better crop husbandry, use of compost, natural pesticides, crop rotation and soil management practices, to keep pace; and the consequent need to demonstrate to farmers the economic benefits of sustainable land management practices. The lack of qualified veterinarians and animal production specialists, given that an estimated 70 per cent of all emerging and remerging disease in humans originates from animals. Traditional government agricultural extension services, as currently structured and funded, face challenges in human and financial resources and cannot meet the diverse needs of farmers in training and information required to adopt the new technologies and approaches. The need to make use of the benefits of ICT and mobile phone-based applications to help farmers with information on improved crop management, pest and disease management; whilst integrating this new technology with social learning in traditional kinship networks. The need to better link farmers to markets and to find ways to develop new, successful models of collaboration between private sector buyers and farmers, taking a value chain approach. The LRD Issue Paper underlines new work to fulfil this need that is driven by or that involves LRD – for example the Improving Key Services to Agriculture project and the Integrated Crop Management project. The lack of or inadequate, policies and legislative frameworks governing the management of forests; and where legislation for sustainable forestry does exist, there is a lack of enforcement of the legislation. Given that most forest is based on customary land; the need to develop community-based sustainable forest management. THe LRD Issue Paper underlines the work of Reduced Emission from Deforestation and Forest Degradation (REDD) and REDD+, and SPC’s role in supporting countries to implement national sustainable forest management practices. The need to reduce the endemic departure of youth from the agricultural sector in search of formal employment, through offering improved income opportunities to participants; the role of LRD in coordinating regional activities linked to national level implementation of the Youth in Agriculture Strategy. The need to develop effective regional and national response strategies, utilizing better evidence-based approaches to policy making. The role of LRD in developing and assisting development of Regional and National Sector policies, to set out a course of action for the next three to ten years and beyond. To serve the purpose of improved evidence-based policy, improving timely agriculture data collection, systematization and reporting is a high priority regional need. LRD will work with stakeholders to shore up existing approaches and develop new approaches to data collection for the agriculture sector. The need to carry out more regular policy analysis that provides specific recommendations that feed into specific action plans. This section is quoted verbatim as it is a tightly worded statement of LRD priorities. “To guide the Land Resources Division in its work over the course of the next corporate plan and indeed the next decade, it is important we get your help, and hear your voice, in mapping out the long-term priorities. The table below from the Asian Development Bank’s Asian Development Outlook 2013 shows estimated growth rates of value added in agriculture for the last 5 years.